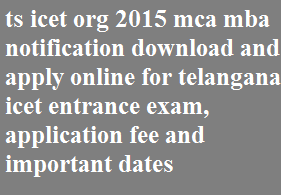 Telangana TS ICET MBA MCA Entrance Examination 2015 Notification Apply at www.tsicet.org : The Telangana State Government of education board Members are Released the ts icet Notification for degree candidates entrance to mba / mca courses. The Educational Qualification, Age Limit, Application Fee and Fines and How to Apply All Details will see in below. The Official Website is www.tsicet.org (or) www.telanganaicet.org. Eligibility to Apply for icet 2015 entrance exam is Any Graduate / Degree candidates to entrance into MBA (Master of Business Administration) and MCA (Master of Computer Application). The Icet Notification Releasing Date is on 28th February, 2015. > With Rs. 500/- Penality Fee Apply on 16th April, 2015. > With Rs. 2000/- Penality Fee Apply on 25th April, 2015. > With Rs. 5000/- Penality Fee Apply on 2nd, May, 2015. > With Rs. 10000/- Penality Fee Apply on 18th May, 2015.